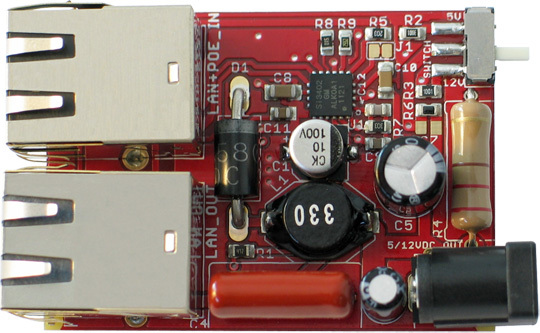 The MOD-POE-V2 board extracts power from the UTP LAN cable network, so you can power your embedded device with 5 or 12VDC, and power and Ethernet are carried at the same cable. Note that the LAN cable should be connected to a PoE-compatible switch/router. The MOD-POE-V2 follows the recommendations set by IEEE 802.3af-2003 standard. MOD-POE-V2 is not compatible with MOD-POE injector (because it needs higher input voltage). MOD-POE-V2 works only in Alternative B (Mode B). Dimensions: (54 x 39)mm ~ (2.12 x 1.54)"
I provide 24V to the input of MOD-POE-V2 but there is no output. What is the problem? 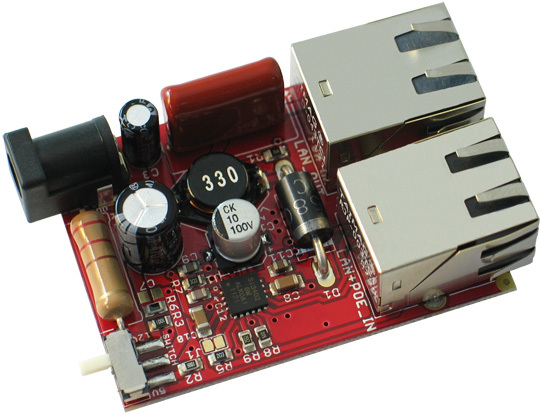 Si3402 has a minimum of 30V start-up threshold (36V maximum start-up threshold). Please provide 36V to LAN+POE_IN and check again. Does MOD-POE-V2 work in both PoE modes - A and B? No. By default MOD-POE-V2 works only in mode B - pins 4–5 form one side of the DC supply and pins 7–8 provide the return; these are the "spare" pairs in 10BASE-T and 100BASE-TX. Mode B requires a 4-pair cable. What is the maximum current output approximately? The maximum output is close to 10W. This means ~800mA for the 12V output mode; ~2000mA for the 5V output mode.